As a new project of mine, I’ve decided to build a miniature community-style cluster using Raspberry Pi computers and HPC-grade software. When I set out to do this, I discovered that instructions on setting this up are actually surprisingly sparse. So, I decided to document my progress in a series of guides. In this Part I, we will look at the basics of setting up the hardware and getting a cluster scheduler running. This project is scalable to as many RPis (and even non-RPi computers) of different kinds as you want, but for my cluster, I used 3 Pis with MicroSD cards of varying capacities connected to my network through an 8-port gigabit switch. Let’s talk storage. Cluster computing requires a storage location that is shared across all of the different nodes so they can work on the same files as the jobs are farmed out. For a basic setup, you can use a 64GB USB drive plugged in to one of the Pis as shared storage (or a larger Micro SD card in one of them). However, as an alternative, if you have some kind of network-attached storage that you can export as an NFS share, this can also be used as the shared drive. The first step is to get our Pis up and running. Start by downloading the latest version of Raspbian, the Debian distribution that runs on the Pis. Download the command-line only “lite” version to save space: Download Here. Now, download and install Etcher. 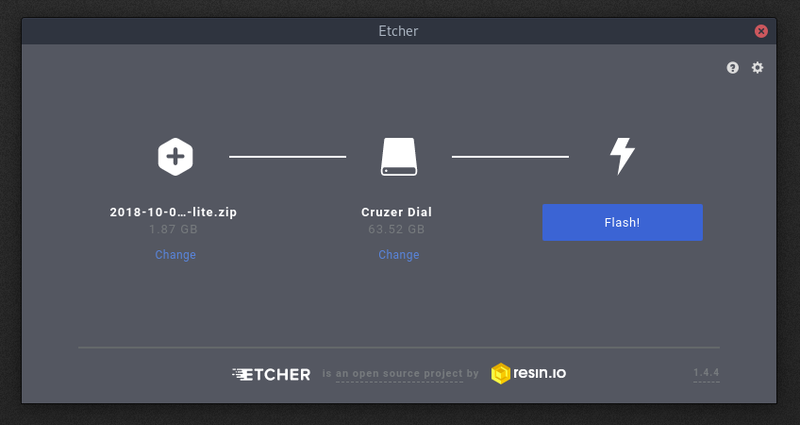 Etcher is a simple program that we will use to write the downloaded Raspbian image to our SD cards. Get Etcher here. Fire up Etcher and plug in your MicroSD card (use an adapter). Select the Raspbian ZIP file and hit flash. Wash, rinse, and repeat this for the other 3 MicroSD cards. Once you’ve done this, plug the SD cards into the 4 nodes. We want to make sure that our nodes have IP addresses that never change. This way, we can be sure that they can always talk to each other, which is critical for the cluster jobs. I recommend setting the Pis up one at a time so you can keep track of which physical node is has what IP. This makes maintenance easier. Start by plugging the switch into your network. Then, connect one Pi to the switch and plug it in. Wait a second for it to boot up. Once the Pi has booted, we can SSH into it to finish setting it up. To find the IP address of the Pi, either use your router’s interface to view attached devices. If you can’t do this, use a program like nmap to scan IP addresses on your network. Either way, look for a device named RASPBERRYPI and make a note of its IP address. Find the RASPBERRYPI device’s IP address. This will open the config utility. Change the default password, set the locale and timezone, and expand the filesystem. Then, exit the utility. A word about hostnames: SLURM, the cluster scheduler we will be using, expects hosts to be named following a specific pattern: <whatever text here><a predictable number>. So, when choosing hostnames for your RPis, it’s helpful to pick a system and number them in order (eg node01, node02, node03, node04, etc…). sudo nano /etc/hosts       # change "raspberrypi" to "node01"
We use the systemd hostname command, edit the hostname file, and update the hosts file so local resolution works. The SLURM scheduler and the Munge authentication that it uses requires accurate system time. We’ll install the ntpdate package to periodically sync the system time in the background. Repeat this process on all of the RPis. In order for a cluster to work well, a job should be able to be run on any of the nodes in the cluster. This means that each node needs to be able to access the same files. We will accomplish this by connecting a 64GB USB drive connected to the master node (more on that below) and exporting that drive as a network file system (NFS). Then, we can mount that NFS share on all the nodes so they can all share access to it. If, like me, you have a separate NAS box on your network that you would rather use as shared storage, you can export an NFS share from that box. Then, just mount that share on the nodes using the instructions below. We will discuss the master node more later, but one of our nodes will be the controller. Just pick one. :) In my cluster, the master is node01. 4.1.1: Find the drive identifier. In this case, the main partition of the flash drive is at /dev/sda1. A word of warning: double check to be sure you’re not about to overwrite your root / directory on accident. 4.1.3: Create the mount directory. Now, edit fstab to mount the drive on boot. Finally, mount the drive with sudo mount -a. Now, we need to export the mounted drive as a network file system share so the other nodes can access it. Do this process on the master node. 4.2.1: Install the NFS server. 4.2.2: Export the NFS share. rw gives the client Read-Write access, sync forces changes to be written on each transaction, no_root_squash enables the root users of clients to write files as root permissions, and no_subtree_check prevents errors caused by a file being changed while another system is using it. Now that we’ve got the NFS share exported from the master node, we want to mount it on all of the other nodes so they can access it. Repeat this process for all of the other nodes. 4.3.1: Install the NFS client. 4.3.2: Create the mount folder. Now mount it with sudo mount -a and you should be able to create a file in /clusterfs and have it show up at the same path across all the nodes. It may be overkill for a personal cluster, but most Linux clusters use a piece of software called a scheduler. A scheduler accepts jobs and, when nodes become available, it runs them on the next available set of nodes. This allows us to keep submitting jobs and they will be processed as resources become available.We will be using a scheduler called SLURM on our cluster. SLURM runs a control daemon on one or more master nodes, then farms out jobs to other nodes. One of our RPis will be a dedicated login & master node, and will not process jobs.What’s a login node? It’s the RPi you ssh into to use the cluster. Pick one of your nodes to be the dedicated master, and ssh into it. In my cluster, this is node01. 5.3.1: Set the control machine info. 5.3.2: Customize the scheduler algorithm. 5.3.3: Set the cluster name. Munge is the access system that SLURM uses to run commands and processes on the other nodes. Similar to key-based SSH, it uses a private key on all the nodes, then requests are timestamp-encrypted and sent to the node, which decrypts them using the identical key. This is why it is so important that the system times be in sync, and that they all have the munge.key file. This step is optional, but if you are having problems with Munge authentication, or your nodes can’t communicate with the SLURM controller, try rebooting it. We will test that the Munge key copied correctly and that the SLURM controller can successfully authenticate with the client nodes. 6.4.1: Enable and start Munge. If you get an error, make sure that the /etc/munge/munge.key file is the same across all the different nodes, then reboot them all and try again. Complete this configuration on each of the compute nodes. We now have a functional compute cluster using Raspberry Pis! You can now start submitting jobs to SLURM to be run on however many nodes you want. I’ll have a crash-course on SLURM in the future, but for now the University of Kansas Center for Research Methods and Data Analysis has good information on getting started here. You may notice that the cluster can’t really do much yet. In Part II of this guide, we’ll take a look at setting up some software and parallel computing on our mini-cluster. These guides are designed to be followed in a top-down sequential order. If you’re having problems with a command, feel free to leave a comment below with the exact number of the step you are stuck on, and I’ll try to answer if I can.